Put the cranberries and orange juice in a small saucepan and bring just to a simmer over medium heat. Remove berries from the heat and set aside to cool and plump. Drain off any excess liquid and set aside. Lightly brush a 12-muffin tin with butter. Sift the flour, baking powder, and salt into a medium bowl and set aside. In a standing mixer fitted with the paddle attachment or with an electric hand-held mixer in a large bowl, cream the butter, orange zest, and 2/3 cup sugar until light and fluffy (about two minutes). Scrape down the sides of the bowl with a rubber spatula. Add the eggs, one at a time, beating well after each addition. Remove the bowl from the mixer. Fold the flour in three parts into the butter mixture, alternating with the milk in two parts, until just combined. Fold in the cranberries. Do not over mix. Divide the batter evenly into the muffin tin and sprinkle the tops with sugar. Bake until golden brown (about 25 minutes). Cool muffins in the pan on a rack. Serve warm. Place all the ingredients in the bowl of a food processor, pulse several times to breakdown the cranberries and incorporate the ingredients. Just so you know, it should still be a bit chunky. 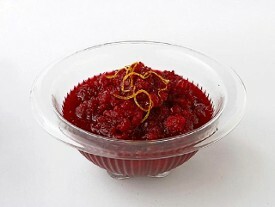 Allow the cranberry relish to sit at room temperature for at least 30 minutes, so the flavors can marry. 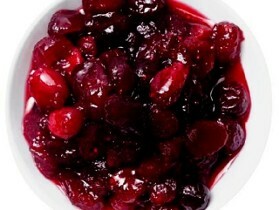 Empty bag of fresh or frozen cranberries into a saucepan and transfer 1/2 cup to a small bowl. Add 1 cup of sugar, 1 strip orange or lemon zest and 2 tablespoons water to the pan and cook over low heat, stirring occasionally, until the sugar dissolves and the cranberries are soft, about 10 minutes. Increase the heat to medium and cook until the cranberries burst, about 12 minutes. Reduce the heat to low and stir in the reserved cranberries. Add sugar, salt and pepper to taste and cool to room temperature before serving.